I am not even sure where to begin with this post. Banana pudding, for me, is not a childhood memory. I lived on the East Coast until 1972 and though I know the joys of real pot pie (wet), real pretzels taken from a cart by an old man with dirty hands (Dad said it added to the flavor), and Pizza (sorry Chicago) I was unaware of the existence of banana pudding until about 1975 when I started dating someone whose grandmother introduced me to both banana pudding and real sweet tea. Banana pudding can be the most amazing stuff you ever put in your mouth if done right and it can be downright disgusting if not. Can you take shortcuts and use instant puddings? Sure…you can also build a house with low grade lumber if you want to, but you may be sorry in the long run. In order for banana pudding to have the right,creamy texture and sweet, rich flavor you need eggs. Lots of them. Beaten until they are rich and thick. Skimp on the eggs and you might as well make something else. Yes it will be fattening. Yes it will be high in cholesterol. Yes it will be expensive. Yes, it will be ethereal, amazing, and potentially an out of body experience. Don’t make this for Christmas dinner. Keep it instead for that night when you a changed a flat in the cold, found out you had the wrong size spare and trudged three miles through sleet to get help. Save it for a night when you want to watch a chick flick and cry. Save it for a night when the family is doing a 120000000 piece puzzle of Einstein’s brain or playing Monopoly. Banana pudding is like your favorite sweats. Comfortable, warm, not elegant or spectacular. You can leave off the meringue if you like and use whipped cream. I use meringue if I am not planning on making angel food cake because there are a lot of egg whites. Heck, use both! Just make sure the meringue is a good, thick consistency. Also… you can make homemade Nilla wafters that are fabulous (Recipe in my book :P) or you can buy Nilla Wafers but please don’t use the off brand. The flavor is different. The bananas should not be overly ripe… not like for banana bread but they should be ripe enough to have deep banana flavor. You can serve this warm or cold. I prefer it warm. Rich, creamy Southern banana pudding chock full of ripe bananas, Nilla wafers and a splash of good Kentucky bourbon. Add a cloud of sweet meringue and you have classic comfort food. Whisk 1/2 cup sugar, egg yolks, and cornstarch in a medium bowl until smooth. Bring evaporated milk, remaining 1 cup of sugar, and salt to simmer over medium heat in large saucepan. Whisk 1/2 cup simmering milk mixture into the beaten egg yolks. 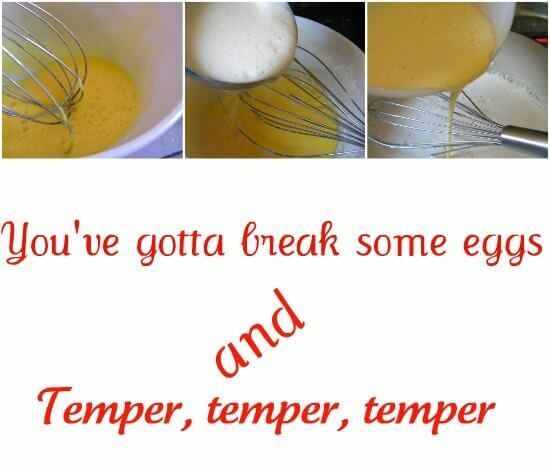 Carefully whisk tempered yolk mixture into the rest of the milk mixture. Cook, stirring constantly, until mixture is thick about 2 minutes. Line the bottom of a 9x13 inch pan with Nilla Wafers and banana slices. Spoon half the pudding over. Add another layer of banana slices. Spoon remaining pudding over and push cookies vertically around the side. Alternately you can make this in a trifle bowl layering cookies, bananas, pudding, then cookies, bananas, pudding.. until it is all used. Allow to stand at room temp while you make the meringue. For Meringue: Beat the egg whites with 1/2 tsp lemon juice and a pinch of salt until foamy. Add 1/2 cup sugar while continuing to beat to stiff peaks. Cover pudding with meringue and bake at 425F until meringue turns golden. Want to cut calories? These are generous servings. Increase the total servings to 16-20 and cut the calories, fat, and carbs in half. Really cut calories? Serve it in stemmed cordial glasses as a small dessert. Love the meringue on top! Cornstarch is corn… corn is a big GMO crop. I admit.. using organic cornstarch may seem odd if you are using plain evaporated milk and NIlla wafers but I try to stay away from conventional corn products. I do often get organic evaporated milk which is available at my local natural food store… or I use organic half and half. Nilla wafers are a secret sin. I make my own, buy organic but I always come back to these.